I’ve been meaning to get this post up this for the last few days and I’m glad I finally have the chance. I feel like one of the biggest problems guys have is not knowing how to wear something, or not knowing what to wear it with. Guys will find something they like in the store, but struggle with how they’d actually wear it or what it goes with. In this post, I hope to address that problem. The first method is ultra casual. I went for a weekend feel with a plain white t-shirt, tan chino’s and white fashion sneakers. 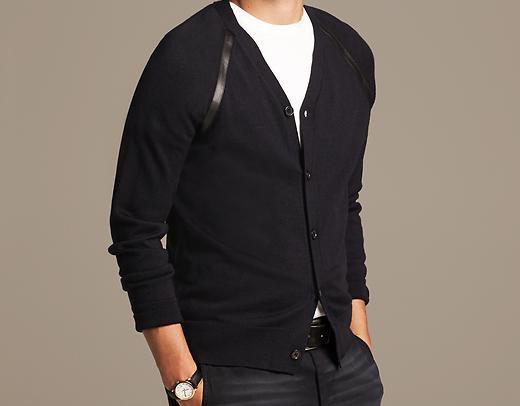 Go with the cardigan buttoned or unbuttoned in this look, but always leave the bottom button un-done, regardless. Next up is still casual, but slightly more elevated. I went with grey jeans, a blue gingham shirt and brown boots with a brown belt. The boots & jeans dresses this down a bit while still remaining polished and current. Swap out the grey denim for light or dark wash denim and go with black boots or your favorite loafer. The options are endless.